The diesel emissions scandal has demonstrated that real-world behavior of systems can deviate excessively from the behavior shown under certification conditions. In response to the massive revelation of fraudulent behavior programmed inside diesel cars across Europe, the European Union has defined a procedure to test for Real Driving Emissions (RDE) . This is gradually being put into force since September 2017 . To avoid misinterpretation, the RDE regulation comes with an informal but relatively precise specification that spells out in how far a real trip, i.e., a trajectory driven with a car, constitutes an RDE test, or not. 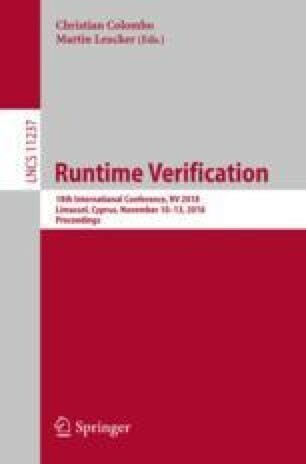 This paper presents a formalization of the RDE test procedure which is used to monitor for RDE violations at runtime and thereby fosters perspicuity. To this end, we extend the stream-based specification language Lola [5, 10] with sliding aggregation windows. We evaluate the approach experimentally using data from real trips and further present a low-cost variant of the RDE test which can be conducted without expensive test equipment solely with on-board sensors. This research was supported in part by the Saarbrücken Graduate School of Computer Science and by ERC Advanced Grant 695614 (POWVER).